While MSM has been widely recognised for its ability to promote joint health and is a key ingredient in many anti-arthritis supplements, its skin care properties are also starting to come to the fore. This is a review of MRM MSM Cream which has been formulated as a product that will maximize and protect skin health. It is also seen by some of its advocates as an effective treatment for scars and the prevention of scarring because of its inclusion in its lengthy list of ingredients of MSM. MSM is an organic source of sulfur, a nutrient that’s involved in the metabolism of over 100 molecules in the body including in the formation of connective tissue. This gives it an ability to help maintain the structure of skin. As such, MSM is said to not only keep skin soft, smooth and supple, but there is some evidence to suggest that it may help in reducing the amount of scar tissue that can develop when the skin is damaged as a result of surgery or other trauma. 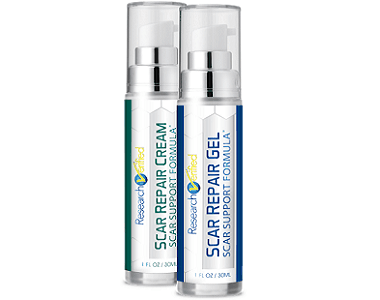 Scarring occurs when the damaged skin and tissue tries to cross-linked across a wound; MSM is said to help ensure that the tissues reconnect in a less haphazard manner, and thus reduce the development of scar tissue. 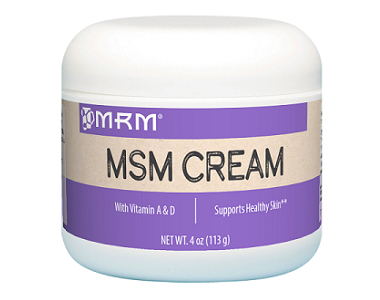 What’s In MRM MSM Cream? Deionized water, Methylsulfonylmethane (MSM); Propylene glycol; capric triglycerides; Glyceryl Stearate; Stearic acid; Glycerin; Dimethicone; Aloe Vera extract; Triethanolamine; Sunflower seed oil; Sesame seed oil; Jojoba oil; Vitamin A (Retinyl Palmitate); Vitamin D (Cholecalciferol); Calendula actiphyte; Citracidal (grapefruit seed extract); Melaleuca oil (Tea Tree Oil); Petroleum jelly; Magnesium silicate; Caprylhydroxamic acid; Glyceryl Caprylate; Vitamin E oil (dl-alpha tocopheryl acetate). Apart from MSM which has been discussed above, most ingredients in MRM MSM Cream are known for their skin softening and moisturizing properties. Others, like Aloe Vera, contain anti-microbial properties that have made it a popular ingredient in herbal remedies for healing blemishes and scars that may result from conditions such as acne. Several of the ingredients also have antiseptic, antibacterial and/or anti-inflammatory properties while others, such as Vitamin A, are known as effective antioxidants. How Do You Use MRM MSM Cream? Apply the cream over the affected area as required. A 4oz jar costs $17.95 when purchased directly from the manufacturer. MRM offers a full refund on your purchase if you are dissatisfied with the product, shipping excluded. You do not have to return opened bottles while unopened containers can be shipped back at your own expense, although this will also be refunded once the product has been received. 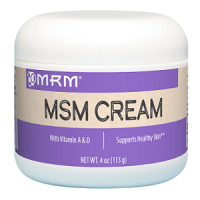 Apart from its main ingredient from which the product derives its name, MRM MSM Cream contains one of the widest arrays of skincare related ingredients of virtually any skincare/scar treatment product we have seen. As such, there is no doubt in our minds that it will make skin softer (albeit possibly at the expense of feeling a little greasy). However, the jury is still out on whether it will really be effective in the prevention of scar tissue formation. It is also important to note that the manufacturer does not position the product as a treatment for improving the appearance of old scars.